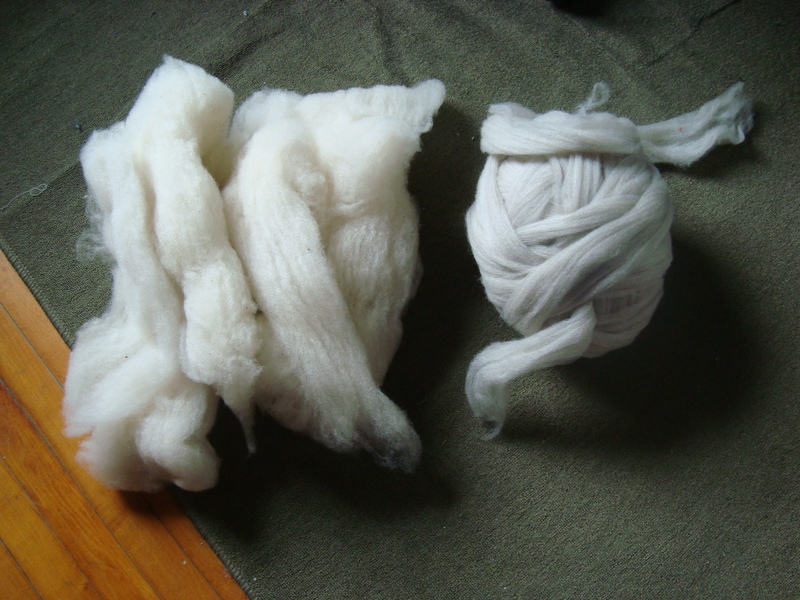 After the Shetland, I had the Rhinebeck fleece that is just dying to become something soon, and two others that I am hand processing from the raw fleece, which could take an eternity. The first fleece is one that I bought at the Door County Shepherd’s Market in 2010, and haven’t touched in at least a year. I kind of guiltily shuffle it around the stash from time to time, but haven’t worked on processing it at all lately. 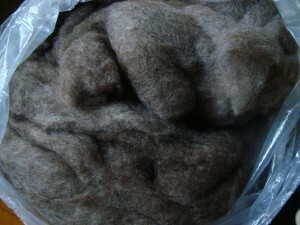 The second fleece is the Gulf Coast that I bought from Coggeshall Farm in Rhode Island last summer. They’re both beautiful fleeces, and they’re both washed and ready to go, but it takes forever to make a dent in those huge piles of fluff with a pair of hand cards. I start out well; for the first few weeks I’ll do a little bit each day, or at least each weekend. I can’t do much at a time, because the repetitive motion tends to annoy my tendons after a while. I get a couple of ounces in, and then look back at the pile left to go and realize it’s going to take years. I have been working slowly away at the Gulf Coast fleece for the past couple of months, stealing a few minutes here or there when the weather is nice to sit out on the porch and card and comb. 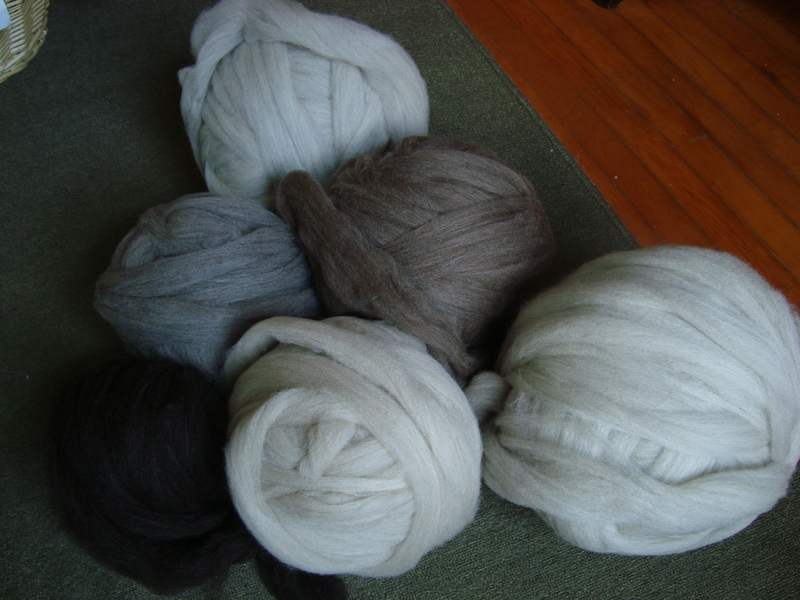 It is making beautiful, airy rolags, but it goes very slowly. I think I’ve processed about 6 oz total so far, and that really isn’t much. I happened to mention this at spinning on Monday, and my friend Elaine jumped up and offered that I could borrow her drum carder. 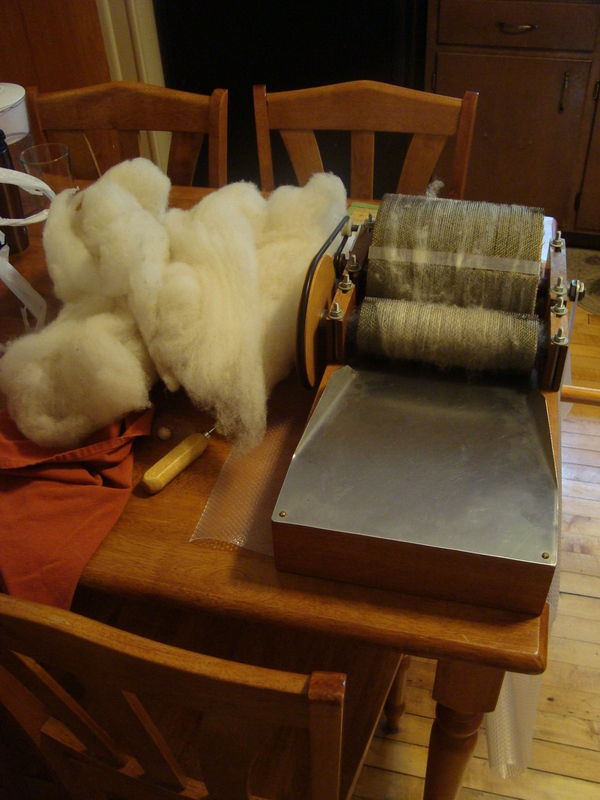 Well, I jumped right on that, both because I want to process these fleeces and because I’ve been considering buying a drum carder for a couple of years now but wasn’t sure how much I really wanted/needed one. Actually getting to use one would help me decide whether it’s something I really need in my toolbox, or just something that’s nice to have. On Monday, Elaine had also brought 3 lbs of cloud roving to spinning. The cloud roving is an interesting prep that I’ve never seen before. It’s like huge batts of carded wool, but it isn’t drafted into roving. She wasn’t going to get to it, and wanted to know if I’d like it? If there’s one thing I am not good at, it’s refusing a home to some wandering wool that’s good quality, natural brown, and in sweater quantities, so it came home with me, too. I’m not sure yet what exactly it will become, but I’m betting on at least one sweater and probably two from the lot of it. And how could you not, with those colors? I also popped into the barns a couple more times to warm up later on. But on that first pass, I whizzed past a booth full of Shetland from Under the Son Farm. They had 7 huge bags of combed lambswool top in all the different Shetland colors. I kept walking, and didn’t even stop to look because I knew it would be fatal. But seeing was enough. It had wormed its way into my brain and it stayed there. Some fibers do this to me, and I’ve found that it’s usually hopeless to argue when they do. I have some pretty good defenses in place, and when a wool makes it past all of them at the first glance, it’s bound to be a good match. There are a couple of skeins that I’ve passed on in the past, and I’ve never seen anything like them again. And, well, I wanted it. We’ve been discussing Branden’s next sweater lately, and he wants a cabled fishermen’s sweater for the next design. I was planning to buy some Blackberry Ridge yarn, since I’ve been waiting for the perfect project to try it on. I thought that the fishermen’s sweater would be just the ticket, but then this Shetland stepped in. That oatmeal or medium gray color would be perfect. I tried to ignore it. It sat there and looked smug. At the end of the day, I sent Branden in to look at the colors. He agreed. Isn’t it amazing how much wool compresses? Add to the Shetland the 3 lbs of cloud roving and the soon-to-be-spinnable fleeces, and I suddenly have quite a lot of spinning to do. I count at least 6 sweaters coming up in the queue, just because I dared to think I might have only one left in line. It should keep me busy, anyway! Oh those natural fibers are just lovely. 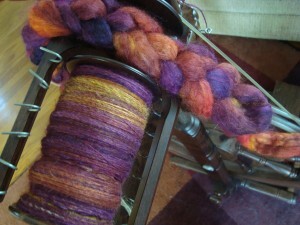 And remind me that I have some handspun yarn in my stash…hmm…. Enjoy all your new fiber! Wow!! I don’t think you need a tutorial on how to use the drum carder!! Are’nt they fantastic? I guess it’s like using a drop spindle and trying to compare it to a spinning wheel. I really love it and the end product is great. I have a pound of this, a pound of that and it all should probably be carded together so I have enough for a sweater. I have a couple of Aran pattern/Gansey books if you need to take a look. You really found some beautiful wool this past weekend. Were the cats curious? Oh, the Shetland colors would have called me, too. Gorgeous stuff! BTW, I find that one can make delicious rolags really fast from a carded batt. 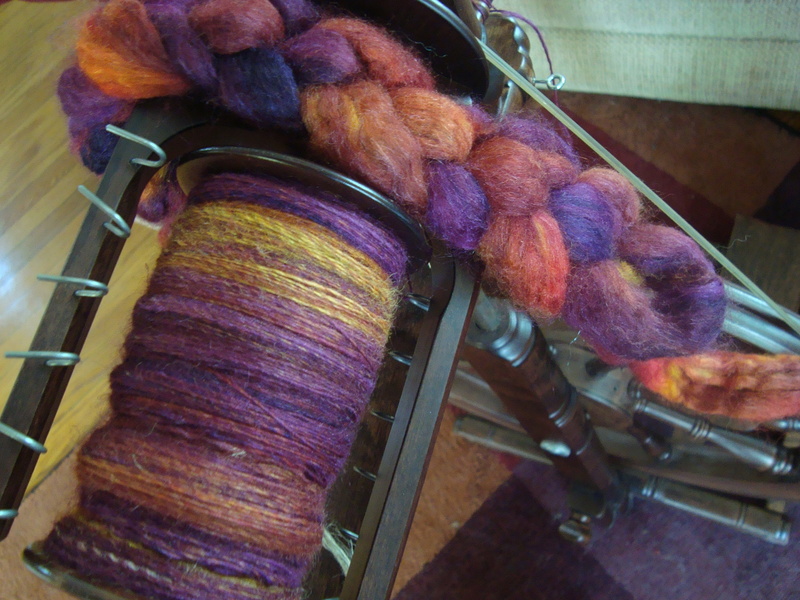 If I don’t like how a batt is spinning, I just whip out the cards and because the fiber is so easy to place and it only takes a pass or two, the rolags just, well, roll off the cards. DesigKnit is powered by	WordPress 4.8.9 . Page generated in 0.449 seconds using 38 queries.